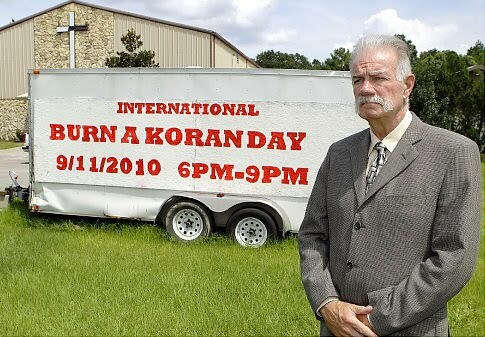 Many people have commented about the ridiculousness that is Pastor Terry Jones and Dove World Outreach Center and their plan to have a Qur'an burning on Saturday. I have nothing to add to what's already been said so well in that regard. Can we please look at this from another angle for a moment? I had this thought when reading this article. For just a moment, let's put Pastor Jones's actions aside as terrible as they are, and focus on what took place in response to his plan. While despicable, two wrongs don't make a right. What does it say about a group of people that, upon the announcement of of a book burning, engage in violent threats and acts that have not only local police but the FBI, Interpol, U.S. State Department, General Petraeus, even the White House and the Secretary of Defense getting involved? If some wacky cult-like preacher with a tiny little band of followers in Gainesville has the power to incite worldwide violence, what does this reveal about a "religion of peace?" For this to have the power to affect international travel? To have every news agency in the world covering it? To get the attention of the President of the United States? To warrant a personal call from the Secretary of Defense? Really? Seriously?? As this article here states, how can such a tiny tail - an independent church with 50 followers - wag such a big dog? Terry Jones has a miniscule following and is truly seen as a freak. He is not representative of Christians, however those responding to the threat of Qur'an burning must have significant representation as they evidently have the power to incite fear and affect international travel and command the attention of world leaders. If a group burned or threatened to burn a truckload of Bibles we'd all think, "wow, that was stupid" but I doubt Christians would be killing anybody over it or even threatening it as much as we love the Word of God. We'd just consider ourselves blessed for being persecuted for our faith, pray for the perpetrators, buy twice as many Bibles, distribute them and keep right on going. Local churches would just come together to raise money for more Bibles while a group of intercessors prayed over the project. Now, we don't have to totally imagine this scenario because actually in 2009, the U.S. Military burned a huge shipment of Bibles that were being sent to Afghanistan by a church. They did so because our government deemed it a a security risk due to Muslims getting angry about proselytizing. So, when our government actually went through with destroying these Bibles what happened? Did any Christian pastors or churches incite violence over this? Of course not. In the media frenzy over Terry Jones, has a deeper message been lost about the violent response to his actions? The media have already shown clips of violent demonstrations that have already occurred overseas as a direct response to Jones' actions. This article states that "...Muslims around the world called for Barack Obama's death at protests to denounce a US church's plans to burn the Islamic holy book on the anniversary of 9/11." Seriously??? Some podunk preacher threatens to burn a book and you call for our president's death? Mighty peaceful of ya. Note, it did not say, "a few extremists called for..." Our government was gearing up for the possible response to the event Saturday because they know the historical response to anything like this. And, they see, what is currently happening as millions around the world have issued a call for violence in response. In this news article, it is reported that hundreds of angry protesters were in Afghanistan and Pakistan burning U.S. flags and chanting "Death to the Christians." Here's another with a rather grim photo. And another example. It's not reported that these are fringe Islamic groups, but simply Muslims around the world who have been hurt by Pastor Jones actions. But wait, wait...I thought this was a peaceful religion. This recent article came out about Imam Rauf stating the our national security depends on whether the mosque is built at Ground Zero. Seriously? Have you ever heard of something so manipulative? A threat of violence if plans to build this mosque are not carried out? How much longer must we hear politically correct pundits refer to a religion of peace when it's clear that any time it is threatened the government gears up to defend against a violent backlash that could affect the safety of millions. I so blame the media for this one. Who picked up this story in the first place? Some news editor should have just said NO! Did the church send out a press release? Pure sensationalism that now has people's lives on the line. Had this not made national news, he could have burned his books and no one would have been the wiser. Who would have really cared? I think the challenge for us to understand cultural equivalency. First, let me say that I don't think Islam is a religion of peace--it was birthed by the enemy and has enslaved countless people for centuries. Let me illustrate cultural equivalency with Christians and Jews. When a Christian tells a Jew that a good-living Jew doesn't go to heaven, they are offended, because they believe "good" people go to heaven, so they hear, "You don't think I'm a good person," when that is not what the Christian is saying at all. I'm not an expert in Islam, but I do understand that they 1. don't hold life as sacred as we, and 2. believe the Koran to be the most sacred thing on the planet...even more than the Prophet Mohammed himself. So...the equivalency is not burning Bibles, but if Pastor Jones had a gun to the head of the children of the Saudi Arabian royal family. Then we would understand the 'declaration of war' aspect, but yet, Muslims would say that is less serious than burning a Koran. I'm not excusing anyone here; I just wanted to interject some understanding that Pastor Jones obviously doesn't have. Thank you for this insight, Paul. And, I do not EVER mind you commenting. I'm honored that you've stopped by. My question would be, if someone does not hold life as sacred how can they consider themselves peaceful? Has this "peaceful" label come from others outside the religion, not within? I totally agree, Deanna. It was a lie from the lips of GWB and Ashcroft. PD: I don't agree with this "eye for an eye" mentality. We (the US) have corrupted Thoreau's/Gandhi's civil disobedience practice to a publicity stunt. What does this Koran burning prove? That we can lower ourselves to their level? The Pastor Joneses of the world make the Christian battle all that more difficult. We have to overcome the ignorance that this man generates. Gayle, I agree with you. I do believe the Pastor Joneses of the world make it more difficult. I don't think anyone here disagrees with that or is advocating an eye for an eye mentality at least in this blog post or comment thread. I was simply making a point that no matter how you slice it, Islam is not a peaceful religion. I am still digesting information and thoughts regarding this. 1 new thought I do have is simply this, LETS NOT FORGET WHAT MUSLIMS FEEL ABOUT ISRAEL! I think it is clear that muslims will not rest until Israel is removed from their land and since America is Israels closest ally this is the root cause of the muslim violance against us. As long as we support Israel there will be jihad against us. Also I just have to mention the recent interview with the Imam feisal abdul rauf (leader of the ground zero mosque). This guy mentioned that if we do not handle this carefully and basically let them have their way that violence could erupt in the Muslim world against us. Now, I am not totally sure he meant that as a direct threat BUT what shocks me is that this Imam is scared the people in his own Muslim World that the radicals will be strengthened and violence will occur. The Muslim faith is at war with itself and he is afraid that the radicals may win. Why is this possible? Why isnt the message of the Quaran clear enough to make it clear to Muslims who follow it that violence is wrong. you can watch the video and at minute 14 you see his concern about the struggle within the Muslim faith. Russell, I agree. One thing I do not understand is, if there is a difference between normal (moderate?) Muslims and extremists, then why are the normals not rising up in droves to denounce and discipline the extremists? They could put a stop to this whole thing real quick. In the Christian faith there is church discipline and perpetrators would be publicly reproved, and removed if necessary. It appears in the Muslim world they are not reproved, or removed and in fact, people get on the bandwagon to defend their actions. When Pastor Jones took the actions he took, Christians everywhere (including myself) denounced his actions and also quickly moved to say, "HE IS NOT ONE OF US!" He has 20 people still attending his church (from what I have heard he has 50 on the official church roll books, and 20 in actual attendance.) Even his town of Gainesville, FL is reportedly making a move to "disown" him, whatever that means. I think that's a good thing. He needs to hear the voice of true Christians loud and clear saying, "we find this behavior unacceptable and do not stand with you." So in turn, where is the "moderate Muslim" voice and why isn't it rising up as a loud chorus against Bin Laden or ANYONE is acting out in this manner? Why aren't they rising up in droves to say, "we totally understand why you would be hurt" in regards to a Ground Zero Mosque and taking the high road? Despite whatever cultural differences there may be the fact remains that we have been told the Muslim religion is a peaceful one and that fact that never been argued by them that I know of. So where are they and why are their voices oddly silent? I believe the answer is, there is really no moderate voice...or it would be talking. You can't keep a giant that big silent, unless at the core that's really what their values are. Just got back from OC,MD, Deanna...and I missed an excellent conversation! Hope I'm not too late to jump in. My brother, a missionaly in the largest Islamic populated country in the world once explained this to me. It might shed some light. All who practice Islam hate those who follow and worship Christ. In our churches we have those who a)say they follow Christ but don't live by example, b)silently follow Christ but accept everyone's beliefs, c)practice their faith daily, d) are bold and share Christ's love in every way and every day. The same pattern exists in the Islamic culture. Those Islamics in "a" and "b" my brother has been able to lead to Christ. Those in "c" listen but thus far have rejected. Those in "d" he witnesses burning homes of believers, the US flag, persecuting those who have accepted Christ, etc. BTW, please pray for the protection of those missionaries serving our Lord in Islamic countries. Absolutely Ruth, the most important thing we can do is pray and you know sometimes the Lord wakes me up in the middle of the night to pray against terrorist attacks, and I do. And I know the same thing happens with many other intercessors. My prayer is that God raises up a ton of people who will commit to pray about this because as the days go on we are going to need more prayer power than ever before. Ruth, you've shared some very valuable insight here. Thanks for bringing further light and understanding. Surely our prayer list is increasing.